True to their name, Ukulele Scramble play a lot of mashups. When they're not twisting styles from across the decades — and centuries — into knots, they're playing ridiculous segues, and repertoire that was definitely never meant to be played on the uke. When's the last time you heard ukulele versions of classical compositions by Charles Ives or Amy Beach? Ukulele Scramble did both, and well! Six years ago, Robin Hoffman described herself as an aspiring uke player. Her main gig was visual art: her two coffee table books feature the illustrations she drew as a regular in the audience at the Jalopy. Last night, on the same stage where she captured a generation of New York Americana music talent in all sorts of revealing, kinetic poses, she played Bach. That was midway through a spiky, sparkling cover of Pink Floyd's uneasy psychedelic pop classic See Emily Play. Her sparring partner in this duo project, Richard Perlmutter, sparred back and forth with the audience in an endless "name that tune" game when he wasn't spinning precise spirals and nimbly plucking out complex classical chords. At least as complex as you can play on a uke, anyway. Hoffman sang the night's funniest song, a version of the Brahms lullaby with new lyrics about being kept awake by a fly in the bedroom — the joke is too good to give away. They did Five Foot Two, Eyes of Blue, which more than one uke player in the crowd agreed was the first tune that pretty much everybody learns to play on it. Throughout the set, Perlmutter's flinty vocals contrasted with Hoffman's cool torch-singer delivery throughout all sorts of clever syncopation and intricate harmony. The most dizzyingly impressive number was a tonguetwisting can-can remake of piece by Offenbach. 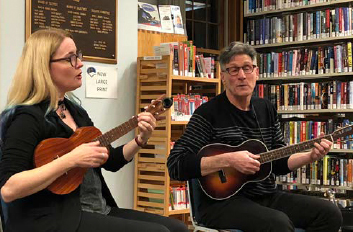 STURBRIDGE —The founders of the Ukulele Scramble, Richard Perlmutter and Robin Hoffman, shared their talent and ear for musical mashups with a receptive audience at Joshua Hyde Library Oct. 26. The two musicians play a wide variety of songs that no one would expect to hear on the ukulele, mixing genres from completely different eras and adding a humorous twist to outdated lyrics to create a musical experience that listeners won't hear anywhere else. "We both like messing with songs and we both like classical music and have a classical music background," said Hoffman. "I feel like the ukulele is kind of a license for messing with stuff, especially because it's a limited palette with only two octaves." The audience at Joshua Hyde Library heard ukulele versions of everything from classical compositions by Charles Ives and Amy Beach to Elvis Presley's "I Can't Help Falling in Love With You," Pink Floyd's "See Emily Play" with a transition into a composition by Johann Sebastian Bach mid-song, and version of the traditional English folk song "Greensleeves," renamed "Sleeveless," that flaunts new lyrics that warn against going sleeveless in the winter. "The lyrics were a little old fashioned, so we changed them," said Hoffman. "Richard has a way with words and has written most of our original lyrics." Perlmutter, the creator, lyricist, and featured performer of Beethoven's Wig and a producer for several Grammy Award nominees and winners, and Hoffman, a former professional ballet dancer and an illustrator with two published books, formed the Ukulele Scramble nearly two years ago and have played throughout Massachusetts at many town libraries and events and at the Jalopy Theatre and School of Music in Brooklyn, New York. "Richard and I both moved here from different places — I moved here from Brooklyn with my family and he moved here from Los Angeles with his family," said Hoffman. "The ukulele is a very social instrument, so we both joined the ukulele club in Northampton and that is where we met. I was so happy to discover that Richard liked so many different kinds of music, but I was especially excited about his interest in Pink Floyd." As the two most advanced players in the ukulele club, they stood out to one another and decided to join forces to challenge the boundaries of ukulele music. "I mostly joined the club to meet people because I didn't know anyone when I moved here," said Perlmutter. "There were a lot of beginners there, but Robin was far from a beginner and we decided to start a more serious enterprise." The two musicians now play a wide variety of ukuleles at performances, including soprano, tenor, baritone, 8-string, and banjo ukuleles, and are currently working on their first recording. They hope that their listeners are inspired to step out of their comfort zones musically and learn about the instrumental potential that a ukulele holds. "We hope that they have a good time and discover an old song in a new way or hear a favorite song in a new way," said Hoffman. "A lot of people who come see us play the ukulele and we hope that they are inspired to go home and play more." 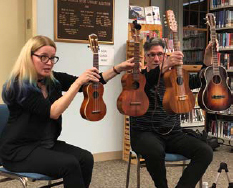 The Ukulele Scramble has upcoming concerts on Nov. 10 from 11:30am to 1pm at McCusker's Market in Shelburne Falls and on Dec. 15 at 2pm at the Forbes Library in Northampton. For more details and a full schedule, go to http://www.ukulelescramble.com. More information about future events at Joshua Hyde Library can be found at http://www.sturbridgelibrary.org.